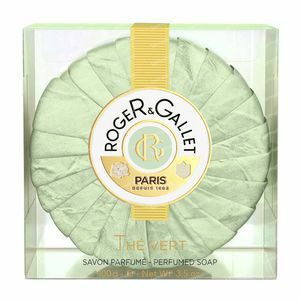 Roger & Gallet Thé Vert Perfumed Soap 100 g order online. The Roger & Gallet Thé Vert Perfumed Soap is one for him and her. Roger & Gallet soaps are produced by a unique manufacturing process. They owe their incomparable fragrance to the artisan tradition and their infinite softness to the quality of their composition, which preserves all the vital functions of the skin. With Green Tea Perfumed Soap, plunge into the serenity of a Japanese garden and allow yourself to be carried away by the radiant, sacred atmosphere of Mount Fuji rising among the tea fields. A soothing and relaxing piece of Roger & Gallet Thé Vert scented soap for the shower or bath. Take the bar of Roger & Gallet Thé Vert Perfumed Soap with you into the shower or bath and lather it up with some water. Cleanse your skin with the creamy foam and apply a thin layer of the Roger & Gallet Thé Vert Bodylotion afterwards to hydrate and protect your skin. Finish the relaxing ritual with a few sprays of the Roger & Gallet Thé Vert Fresh Fragrant Water. SODIUM PALMITATE, SODIUM COCOATE, PARFUM, TETRASODIUM ETIDRONATE, AQUA, HEXYL CINNAMAL, GLYCERIN, HEXYLENE GLYCOL, PROPYLENE GLYCOL, LINALOOL, BENZYL SALICYLATE, LIMONENE, TETRASODIUM EDTA, BUTYLPHENYL METHYLPROPIONAL, GERANIOL, CAMELLIA SINENSIS LEAF EXTRACT.